Oh. My. GOODNESS! 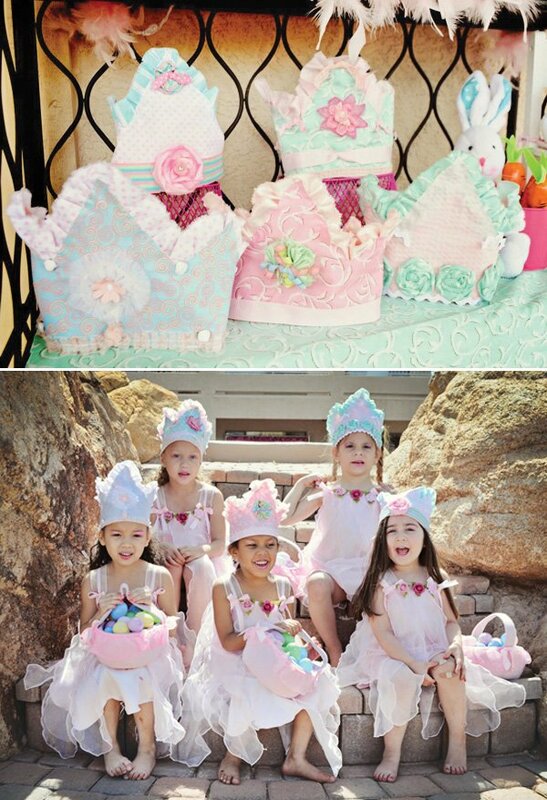 I am so in love with all the charming & crafty details of this shabby chic style Princess and the Pea Birthday Party by Michelle of Maddycakes Muse! 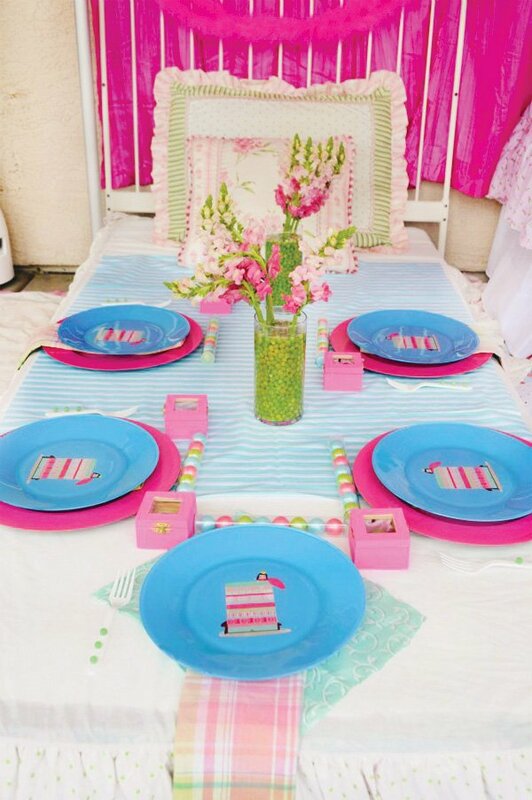 In keeping true to the classic fairytale, Michelle created an ADORABLE “bed table” for all the little princesses to dine at – complete with pea-adorned utensils and pea-filled flower centerpieces! 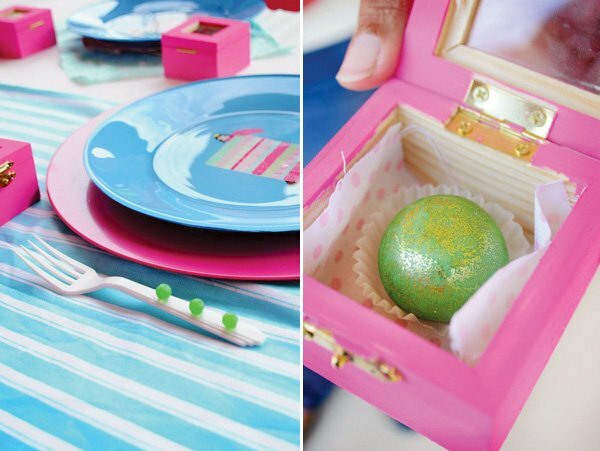 She also created the cutest DIY plates using a darling design from Paper and Pigtails + paint & glass Dollar Tree plates, as well as sweet little pink wooden favor boxes filled with edible glitter truffle “peas”. 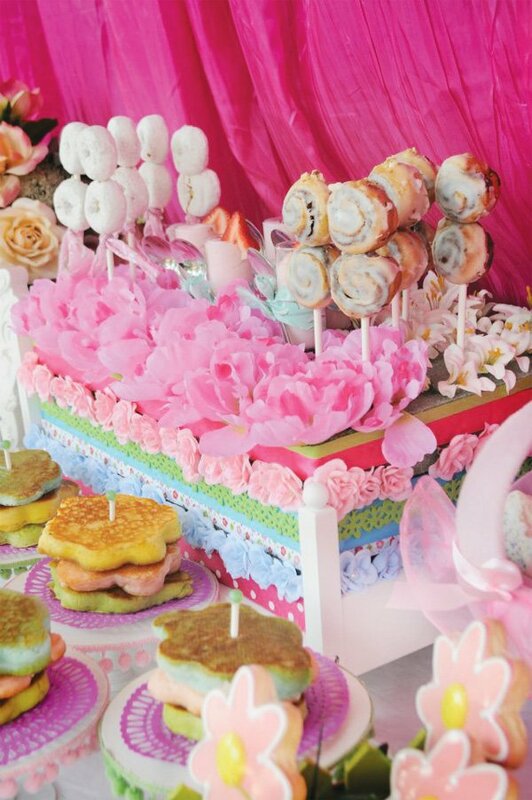 And let’s talk about the ridiculously clever breakfast buffet table, shall we…. 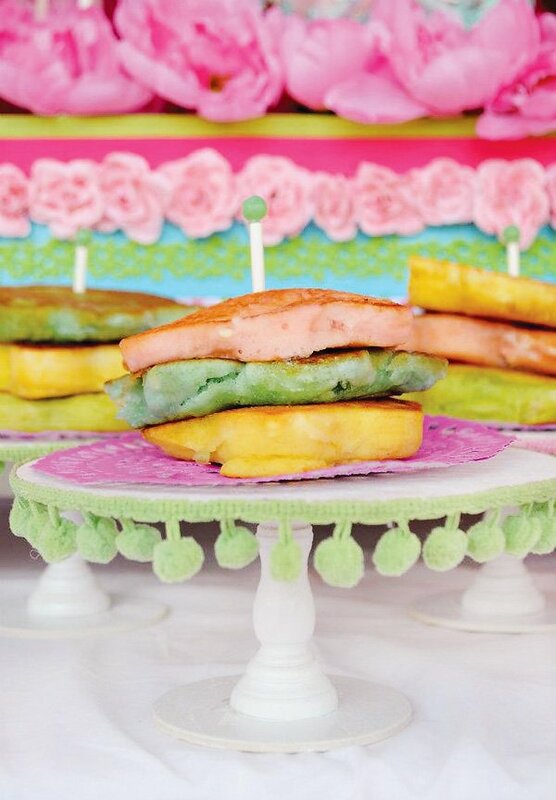 stacks of rainbow pancakes embellished with pea-topped picks and served on mini DIY wood pedestals, yummy cinnamon bun and donut skewers displayed from an embellished doll bed centerpiece (love it! ), milk bottles wrapped in vintage fabric, and more! My daughter, Madison, has been wanting a Princess party for over a year. Since my business, Maddycakes has a signature Princess party that we do all the time, I wanted a different spin for her party. Madison loves the Princess and the Pea book so we decided to go with that theme. My starting point was the adorable Princess and the Pea party printables I found at Paper and Pigtails. I have worked with Kori (Paper and Pigtails) before and she is such a joy to work with. I asked Kori if she could send me an enlarged Princess and the Pea image so I could make a shirt transfer. For the invitations, I used her editable invitation and attached the Princess and the Pea shirt that I made and the hot pink yoga pants from Old Navy. The girls were asked to wear their included pajamas to breakfast. 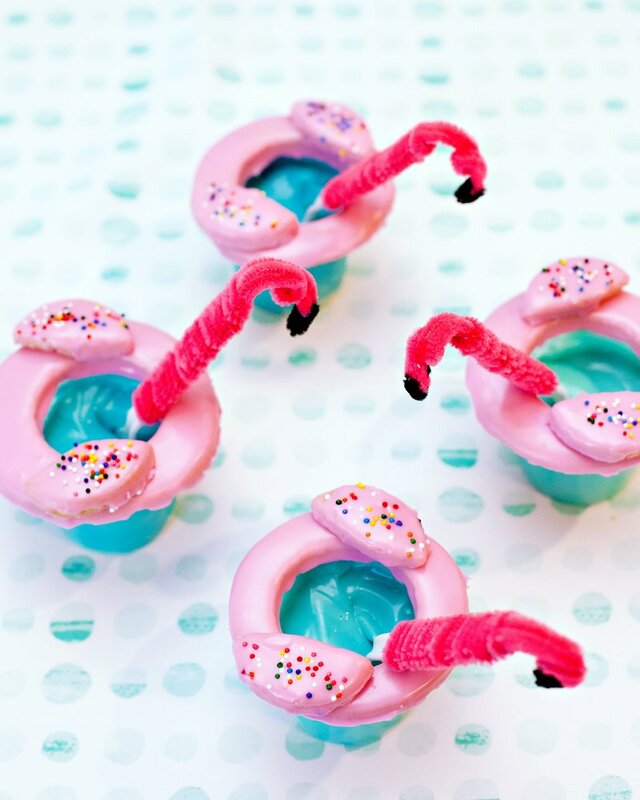 I’m a DIY crafty girl who knows you can have a fabulous party on a budget. 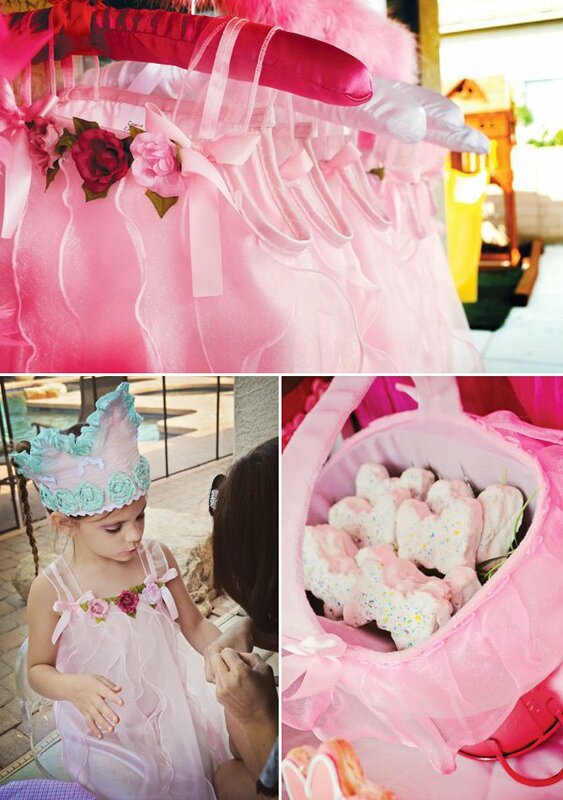 As in most of my parties, I crafted many of the items for this princess party. I knew I wanted to go with the whole bed theme and my inspiration was the bed table from Jennifer of HWTM seen some time ago on her blog. I thought since I was serving breakfast it was a perfect fit. Since this party was not for Madison’s birthday we kept it small. I knew for the breakfast buffet table, I wanted to have a bed centerpiece and found a perfect doll bed at JoAnn’s on clearance! I stacked styrofoam then hot glued ribbon and flowers to make the “mattresses” like in the story. On the top of the styrofoam, I stuck in store-bought mini powdered donuts and cinnamon buns on sticks, and strawberry yogurt. To fill in, I placed flowers into the styrofoam. I made the pancake stands with candlestick holders from JoAnn’s, 6 inch round wood piece for top, 3 inch round wood piece on the bottom and E-6000 glue. I spray painted the whole stand white. Once I put them together, I realized it needed something more so I added pom pom ribbon. To be food safe, I placed a hot pink doily found at Dollar Tree on top so that the food would not be directly on stand. For the pancakes, I found a flower egg and pancake mold at World Market. I wanted the pancakes to be different colors to simulate mattresses which was easily done with a few drops of food coloring. To keep them from sliding off stands I secured the pancakes with a lollipop stick through the middle that I hot glued a green pea (bead) on top. I am not a great baker so store-bought is the route for me. I put Little Debbie Butterfly cakes in a Princess tutu basket and Spring flower cookies from Dollar Tree in a fence basket I already owned. The milk containers are Starbucks Frappuccino bottles that I have used for so many parties. 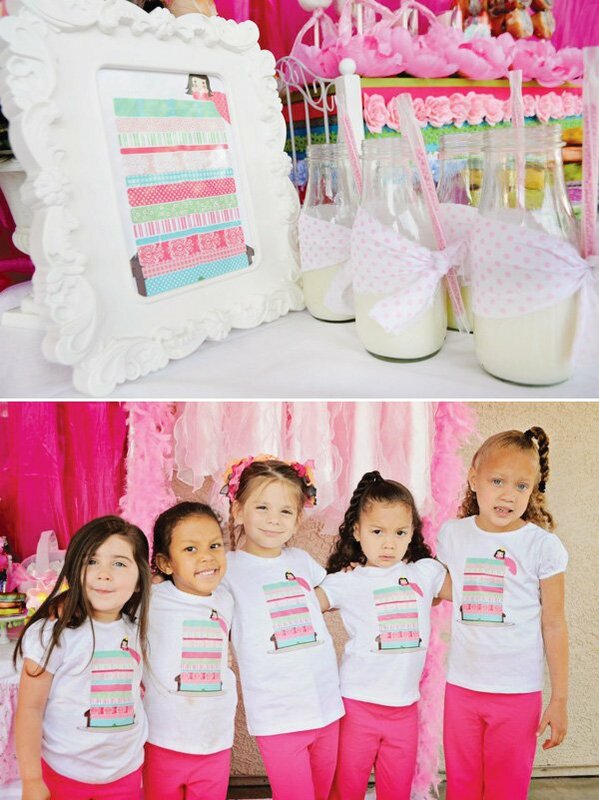 I added Strawberry Magic Milk Straws with fabric. I used the box spring from Madison’s bed along with her bedskirt, sham and pillow. I cut installation foam to fit on top of box spring to make it sturdy for use as a table. I added coordinating fabric and spray painted gold chargers hot pink. I got the glass plates from Dollar Tree and used the Paper and Pigtails Princess and the Pea pattern and glass paint. Everything is done on the back of glass plates so you can use them for food. 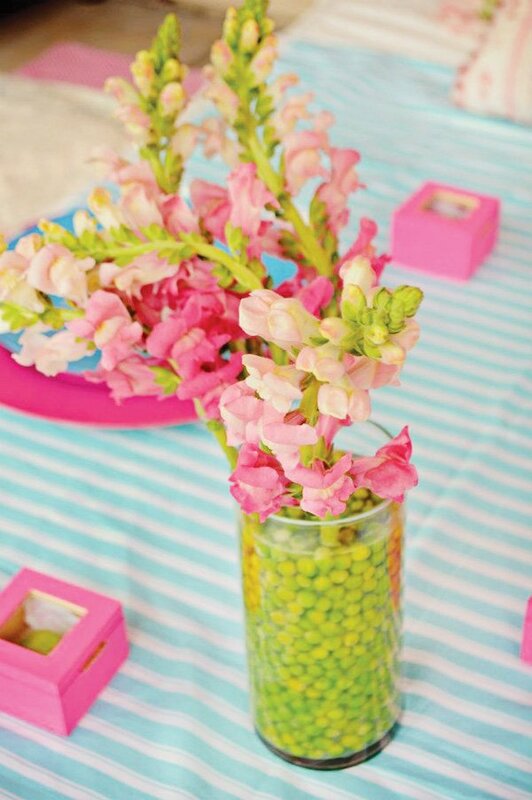 The centerpieces are glass vases from Dollar Tree filled with frozen peas and flowers. I got the white metal headboard on Craigslist. I got the unfinished wood boxes from Michael’s and painted them hot pink. I filled the boxes with an edible glitter truffle “pea” from my amazing friend and inventor of the Easy Roller, Jennifer from The Best Cakepops. The girls had their nails and make up done. Since the party happened around Easter we colored eggs and went on an Easter egg hunt. However, if this party was not during the Easter season, I would have had a cereal necklace building station as an activity. I saw a picture on Pinterest of the most beautiful fabric crowns. I sent the picture to my talented party friend Shawna of Shawna Brockmeier Styled Events and she made the most amazing fabric princess crowns. The crowns turned out more gorgeous than the pictures! 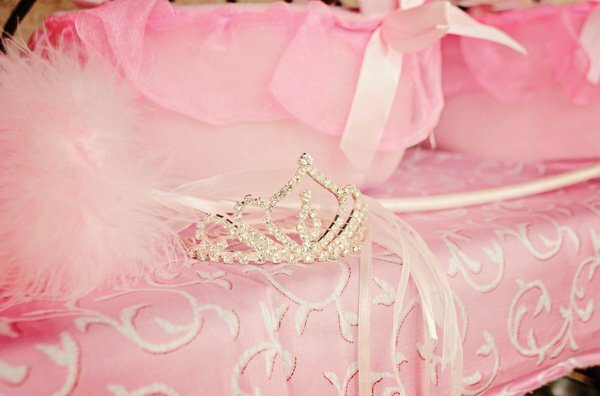 So all the girls received the gorgeous princess crowns, gumballs in plastic tubes, shimmery green pea truffle, and pink princess dresses. 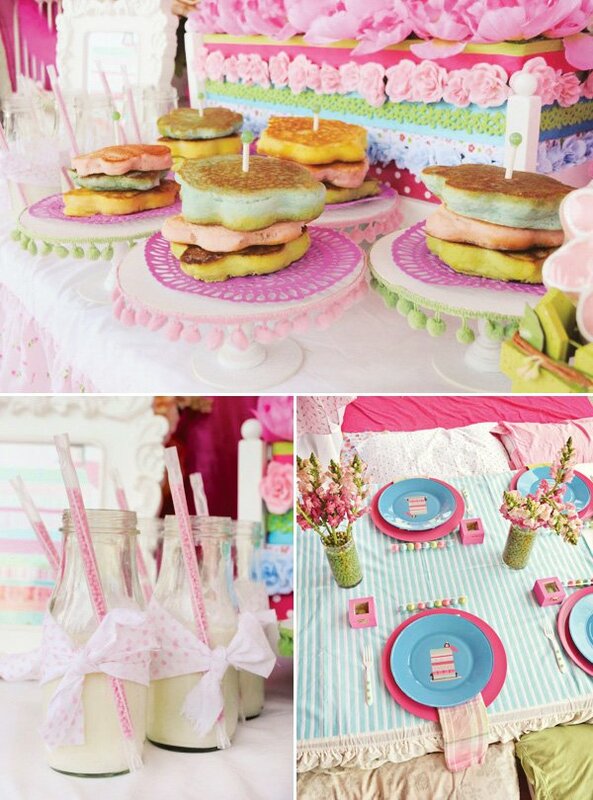 such a cute party my lil lady would love this! WOW!! All of the details are amazing! 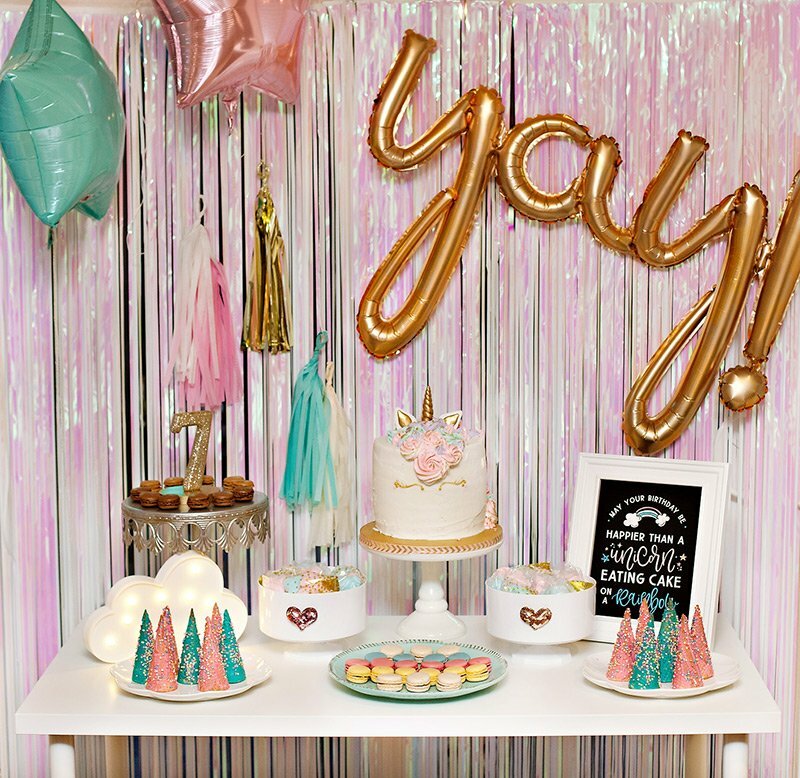 I am seriously blown away by how darling and creative this party turned out!! Great Job Michelle!! love the fabric crowns, dose your friend sell these? Sooo CUTE! 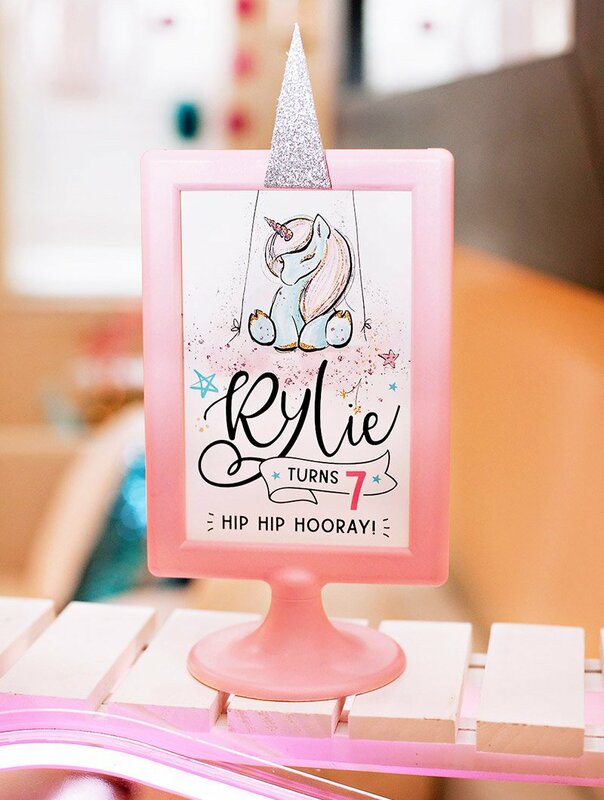 Such a fan of Maddycakes Muse! Love EVERY detail! Would you mind sharing how you made the plates? Very simple. Just apply image to back of glass plates then use glass paint (will take several coats) then back in oven. The directions for proper use of enamel glass paint is on bottle. You can find the enamel in any craft store. Beautiful job, Michelle!! (and Kori!) Love the glitter bon bons and the peas everywhere! Gorgeous, Michelle!!! My daughter loves this story as well. The details are amazing as usual! It is always a gift working with you my innovative friend–your parties are filled with thought and love. 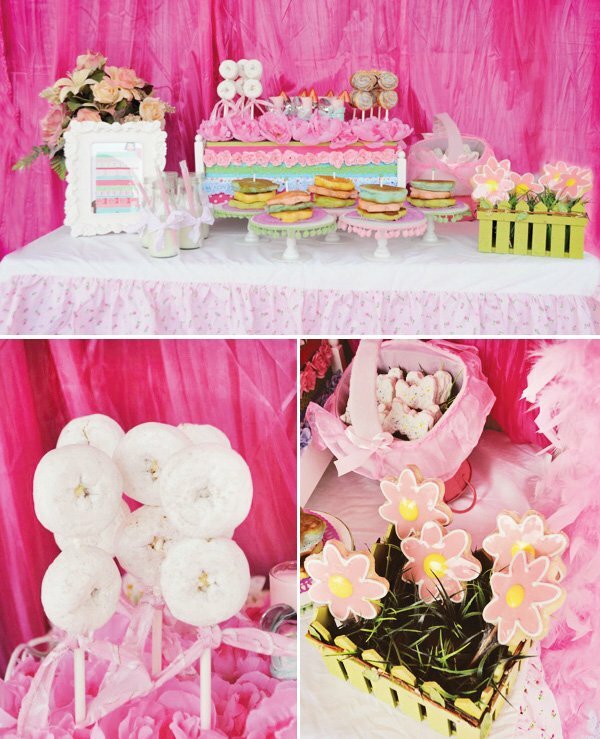 The details are simply gorgeous, these girls will NEVER forget this party!! So stunning!!!! Ties little peas on top of the pretty pancakes are priceless. Every little girls dream come true. I love everything Maddycakes…she is just incredible! WOW! I just love this! Sooo stinking adorable! Stunning party! This is gorgeous! Loving the bed/table! Do you know who makes those dresses? I have seen them before….. I got the dresses at Cracker Barrel…50% off! 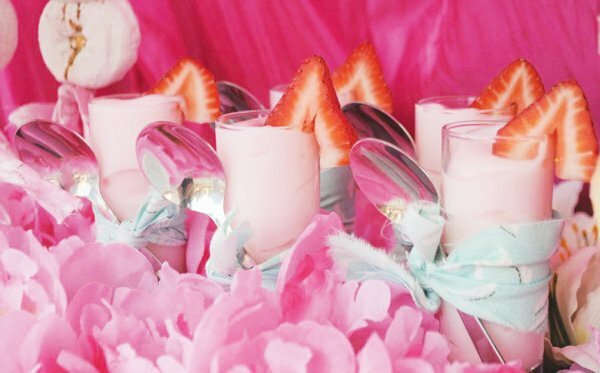 This looks the sort of party every little girl dreams of! All the fine details are fantastic and I particularly like the milk bottle idea. I love the food ideas for this party the most, very creative!